I don’t believe in working for free. Business is an exchange. Services rendered should have a tangible return on profits. Graphic Design is equal parts business as it is art, communication and marketing. With that being stated, why is it such an Olympic feat to make your client understand that: payment is not a privilege? When you are interacting with your client, you and your client are in business together. Ultimately, the goal is for both of you is to profit from the exchange. There should be nothing shocking or surprising about wanting to be paid for working. Yet, we are the only industry where Speculative Work is actively practiced. Speculative Work, is defined by AIGA as work done prior to engagement with a client in anticipation of being paid. Symptoms of Speculative Work often include: the promise of exposure and experience; the phrase “it will be great for your portfolio!”, the seduction of experience and the client getting away with free labor. Can you imagine this applied to any other profession? Picture a room full of dentists. Tell a dentist that, you’d enjoy some tooth surgery – but you’d really like it if they could give you a few examples of capacities first. So maybe, if he can just fix a few teeth for free just to judge how good he is before you pay him, that’d be okay. Its only a couple of cavities. Or, maybe they could all do one tooth each and you’ll pay the one that did the best tooth. You know if you fix my teeth for free, I’ll tell all my friends that you’re a really sweet dentist. I can take home a pen with your practices’ name on it and carry it with me all the time. Professional designers work very hard at their craft. They devote an obscene amount of time learning techniques, doing research and envisioning strategies for the design. Spec Work devalues us as a profession. Design is inherently problem solving. Problems can only be solved when the problem is understood. Spec Work usually involves very minimal or no direct contact with the client. When the client does play a part of the design process; Ideation – which is the bulk of design process is not given its due credit. A client that doesn’t respect ideas is not a client you want to be working with. Son of A Pitch*, or The Art of Avoiding Free Pitching. Free Pitching comes in many forms. They also have a handy chart that elaborates the most common ways, we as designers experience Free Pitching. Advertising, Marketing and Creatives are all industries that are closely linked. There’s a lot of bleed over and a lot of practitioners in one of these industries, often also practice in another. Often Entrepreneurs will view these disciplines as the same, which can probably explain why ‘Pitching’ is prevalent. So often, the main issue with Free Pitching is that the designers who ‘lose the pitch’ get absolutely no returns on the time, energy, resources and money spent on creating the pitch. In fact, a lot of corporations are always eager to say that they ‘retain the creative rights’ to the project that you pitched for. The end result is just a lot of unpaid design time. 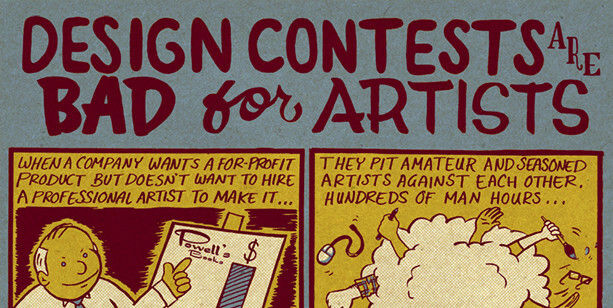 Its even worse in the case of design contests. Then, there are clients who ask for multiple works. We’ve all had that client. The one who asks for five different variations of a home page. The one who just wants to pick something that he thinks looks aesthetically pleasing, but will only be bill for one ‘completed design’. The ones who mask out total overhauls as revisions. Beginning designers (and even seasoned professionals) fall into these traps so easily. *The line, ‘Son of a Pitch’ is graciously taken from Spanish Agency, Dvein. How Do We Fight Spec Work? We stop participating in it. It’s that simple. We have to talk it over with clients why the word is unethical and not good for business. You have to educate them and re-negotiate the terms of your contract. AIGA actually helps out designers by providing an example letter that speaks out against speculative work. Instead of working Spec, look for charities or similar projects that could do with a redesign. Your Portfolio will look better in the long run. We’d love to hear your opinion about this. Let us know your comments by leaving a comment below. You can also hit us up on our Facebook, Twitter and Google+ profiles. Lastly, our RSS Feeds is open for subscription, so that you can be informed!